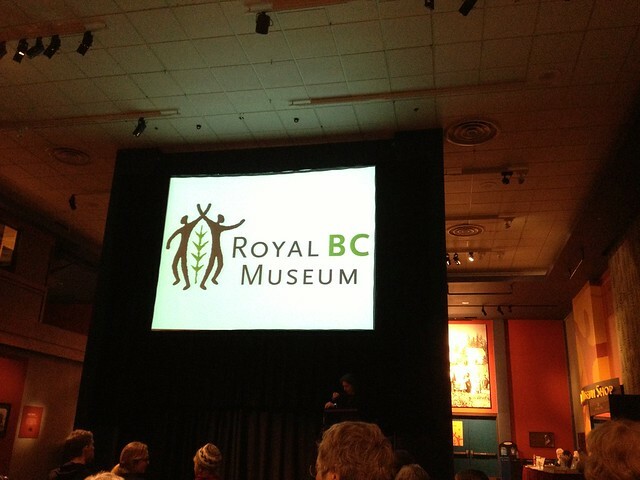 The Royal BC Museum has been hosting a series of events title "BC Bites & Beverages" highlighting some of the delicious history of our province. 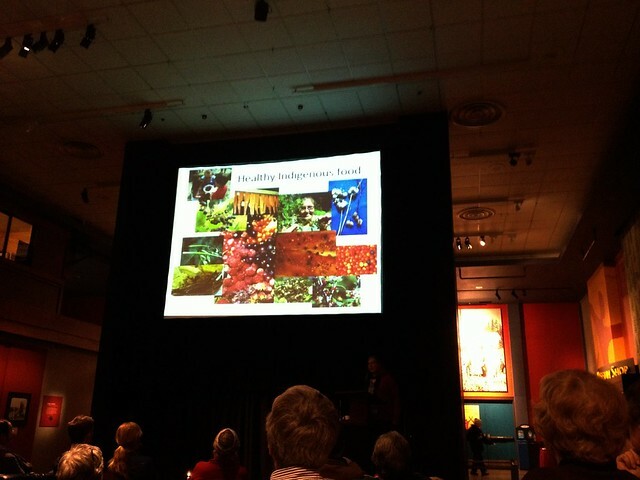 Past lectures have included topics like "the Bounty of of the Harvest" and "the Resurgence of Local Food." The lectures take place in the Clifford Carl Hall, just off the main lobby of the Museum, next to the gift shop and cafe. The space is transformed from a casual seating area to a lecture space, with clusters of tables and chairs facing a raised stage area and video projector. I was thrilled to attend the series, as this is the first time I have approached an organization asking to attend an event as 'blogger/press', and was thrilled to be invited to help promote this fantastic set of lectures. "Rich in Food" was a fabulous event, and I encourage you to check out the next events in the series! Join historian Sherri Robinson as we explore Victoria’s competitive nature when it came to candy and chocolate production in the Colony of yesteryear. From the simple production of candy in a frying pan to the sophisticated assembly line, there was something made to suit everyone’s taste buds! Wine making in BC was not always a sophisticated pursuit towards making the perfect wine. Drawing on our extensive British Columbia wine label collection, join Dr. Hammond for a sparkling toast to forgotten classics and pop a plastic cork to the popular wines of the 1960s and 1970s. Enjoy award-winning local wines paired with delicious BC cheeses at this informative evening. I was quite excited to attend the "Rich In Food" lecture, a discussion of traditional and modern First Nations food from the West Coast. As I have become more involved in researching and attending local food events I have felt like this particular section of our local food history has been missing from my understanding. I was thankful to have an opportunity to rectify this! The event was sold out, with 100 people packing the space to hear the guest speakers, Nancy Turner from UVic, and Dolly and Annie Watts, co-authors of "Where People Feast: An Indigenous People's Cookbook." Samples of some of the foods found in Dolly & Annie's cookbook were served during the intermission. 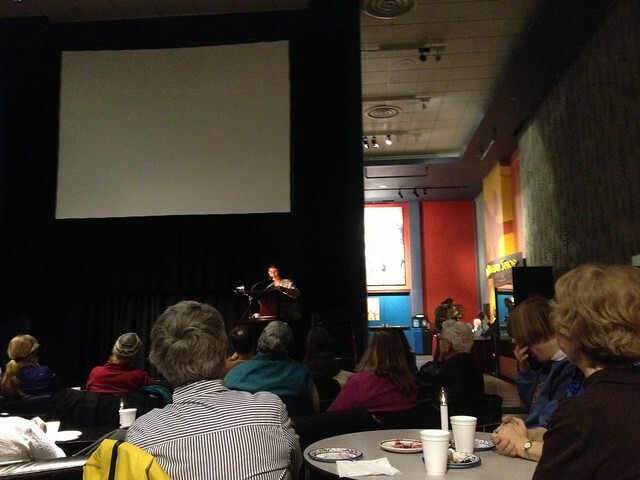 The evening opened with an introduction to the food sources found on Vancouver Island in pre-colonial times. "This was the original 100 mile diet," she grinned, explaining further that foods were collected while they were in season, and there was vast knowledge and techniques for gathering and preservation to ensure there was enough food to last year-round. I was quite interested to hear of a few facts about foods that were historically found in Victoria, but have since disappeared. Nancy recounted how early explorers to Victoria described walking knee deep in a variety of clover, which gave "Clover Point" its name. In another story, an Elder lamented that the most famous location for shellfish on the island was where the Empress Hotel stands now. This was one of many shellfish locations on the island which were managed by the local tribes to allow for continuous production. She also revealed that until encountering colonial explorers, bannock in the format we know it now did not exist, as it requires flour. However, a substance derived from camas bulbs was used to make a similar food. After the intermission Annie and Dolly watts took the stage to speak about their experience as producers of traditional and modern First Nations cuisine. They began by showing a youtube video that explained the accomplishments of Dolly, as she found herself becoming known for her delicious catering featuring traditional West Coast delicacies such as alder-smoked game meat, oolichan and pemmican. Originally from the Kitwanga area and a descendant of Gitxsan chiefs, Dolly remembers going with her family to gather berries and collect and preserve foods when she was very young. Then, she was taken from her family to grow up in a Residential school in Port Alberni. Traditional food didn't resurface in her life until she began selling bannock at a food cart outside of the Museum of Anthropology at UBC. "I didn't intend for this to be my career," she explained, "I wanted to study Anthroplogy and come home and explain our history to my people." Annie, Dolly's daughter, talked about the importance of food and family in her life, and how much being involved in the journey from bannock to the restaurant to the cookbook, had completely changed their lives. After the success of the bannock stand, Dolly opened "Liliget" (which translates from Gitxsan-imaax to "where people feast"), a long-house inspired restaurant in Vancouver serving Indigenous cuisine. After the restaurant closed in 2006, Annie and Dolly worked to document their favourite recipes from the restaurant into Where People Feast: An Indigenous People's Cookbook ($24.95; Amazon.ca). It was from this cookbook that the dishes we sampled this evening were produced. Pemmican is a food with a long history in BC. I remember learning about its importance to early colonial explorers of the coast who learned how to make it from the local tribes, who used it as a source of energy and protein that was easily portable and durable for travels between hunting and foraging locations. This pemmican was made with dried berries soaked in sunflower oil and smoked venison. Usually, Annie explained, you would incorporate more fat from the animal but because of the oil from the berries it was unnecessary. 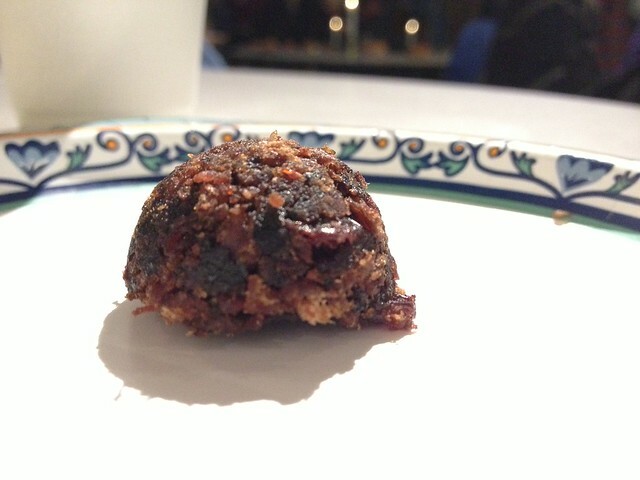 The smoky-sweet combination of the small half balls was a perfect combination. I snagged a few extra off the tray as we left and savoured each bite. I can see how this is an energy rich food, the umami sensation reminds me of eating sashimi or a mushroom dish. These clam fritters were inspired by corn fritters that Dolly loved. "One day mom decided to try replacing the corn with clams," explained Annie. She said they don't use fresh clams for this dish, because jarred clams are easier to work with, and the nectar is useful for flavouring the rest of the fritter. 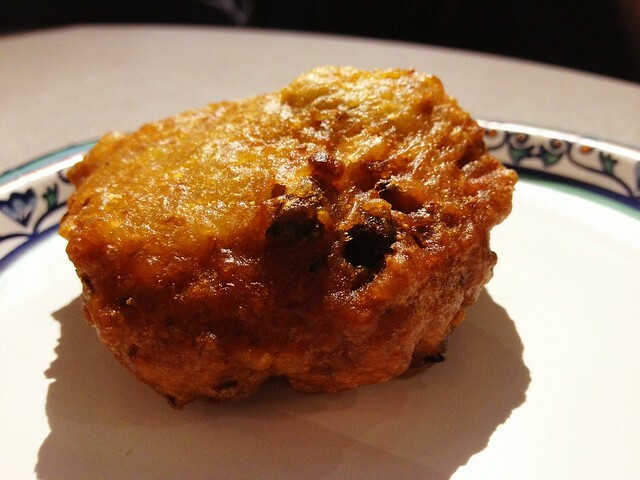 Although the fritter was a bit cold by the time I got to it, it was still light and flavourful. Although I am not always a clam fan, and was slightly worried I wouldn't like it, I found the flavour to be delicious - proof that anything is delicious when it is deep fried! 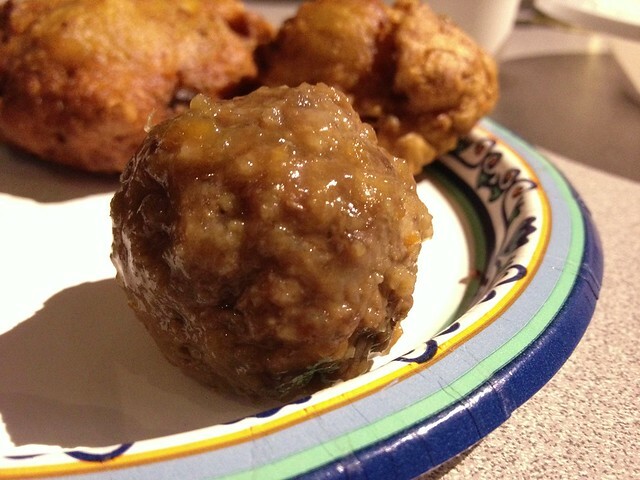 This meatball was jokingly called a 'Swedish' meatball, featuring Dolly's "Sweet & Tangy sauce." The meatballs included bannock breadcrumbs and Worcestershire sauce. They certainly beat the pants off anything served at IKEA, and made me consider seeking out some venison to add to my roster of meat consumption. 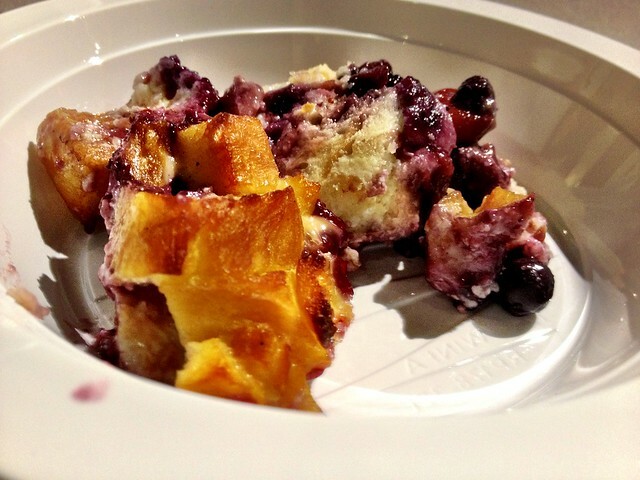 For dessert, bannock & berry bread pudding was served. While often regular bread pudding can be a little on the dry side, the bannock added a richness and moisture to the pudding. Berries were a particularly important source of food for West Coast first nations. Annie described how when Gitxsan people would come together to feast, there would be a 'berry bowl' and everyone would bring berries they had collected to mix together. For more information about "Where People Feast" visit their website at www.wherepeoplefeast.com. For more information about upcoming "BC Bites & Beverages" events visit the RBCM events page.